It is hard to keep track of all these hurricanes this year which is too bad for people who live in the Southeast United States. I went to the ESRI’s Hurricane Maps and Help, but Rita doesn’t seem to be on their radar yet. Lucky for us, ArcWeb Services has tons of weather services that don’t require any hacking on the users part. 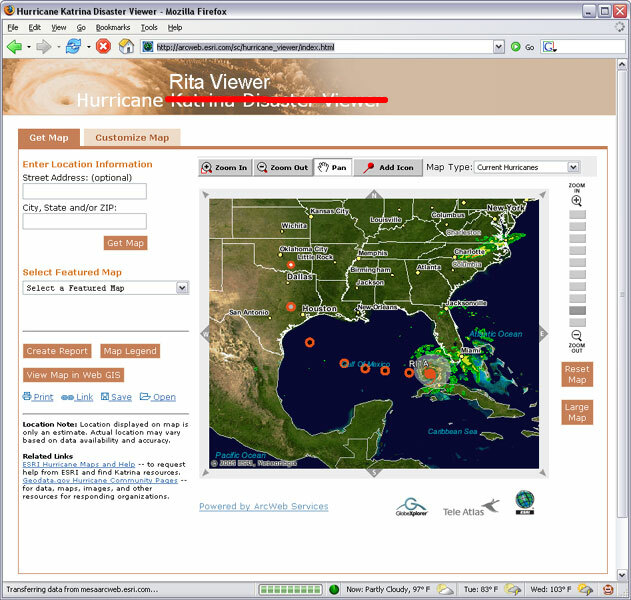 Just open up the Hurricane Katrina Disaster Viewer, zoom out all the way and then from the “Map Type” drop down list at the upper right, select “Current Hurricanes”. It shows the power of ArcWeb services and how having so many types of map services (beyond just satellite imagery) keeps your web applications up to date (but unfortunately for ESRI they put the word ‘Katrina’ in the page graphic). To all my friends in Houston, good luck and I have room for you here in Arizona.